Decisions, decisions, decisions… What now? That’s what I was thinking to myself as I sat in my room in Santiago. I had completed my Camino, I’ve already explained my… ummm… need… yeah, need… to get out of Europe because I overstayed my tourist visa, but I didn’t quite know what to do. My lovely camino companera had suggested I find a nice quiet place to relax, recover and reflect on my camino experience. After letting that thought marinate in my brain for quite sometime, I came to the conclusion that she was right… I’d been on the road in some form or another (basically) since the day I left San Francisco, and I had not yet taken anytime time (maybe some hours here or there) just to sit and think. I already knew that I wanted to go to Africa… so I fired up the intrawebz and started looking for beaches in Africa that were within reach of a relatively cheap flight from Spain. Morocco was the obvious choice, but I somehow got the idea in my head that it would be a little bit of an adventure to make an overland trip across the continent… and the only way to really do that (safely) is to go north to south (or the south to north) from Egypt to South Africa. 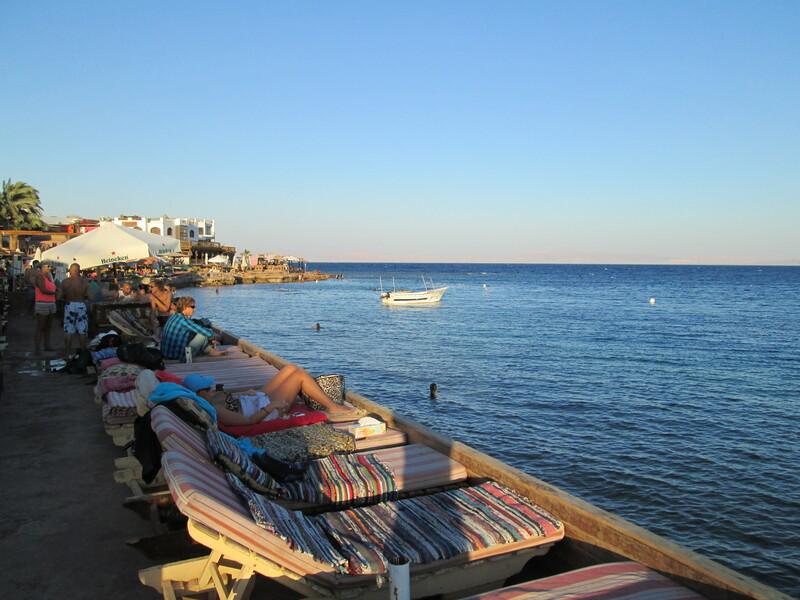 I thought that Egypt must have beaches right (yes, yes they do)… and came across some articles featuring Dahab. They sounded good, so I checked skyscanner.com and found a relatively cheap flight from Santiago to Sharm El Sheikh airport (Dahab is 100 kilometers up the coast from Sharm El Sheikh… or 60 miles for those of you who don’t do metric) leaving in two days… so I booked it (and visas are available upon arrival in Egypt… yes, I did check). I didn’t really know what to expect. The only thing I had really done was to figure out the expected prices for how to get from the airport to Dahab by various modes of transportation without being ripped off like a total sucker. 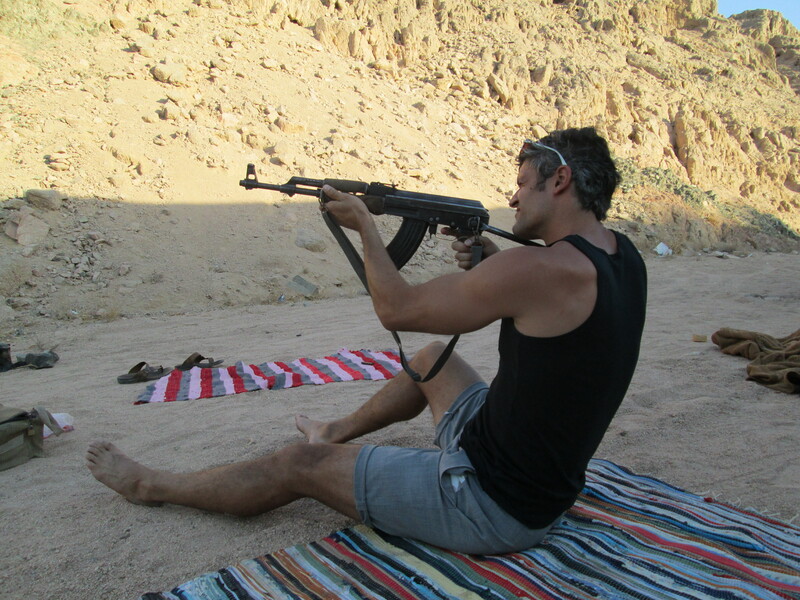 When I landed I changed some money, went through immigration, got my bag and found a guy to take me to Dahab. 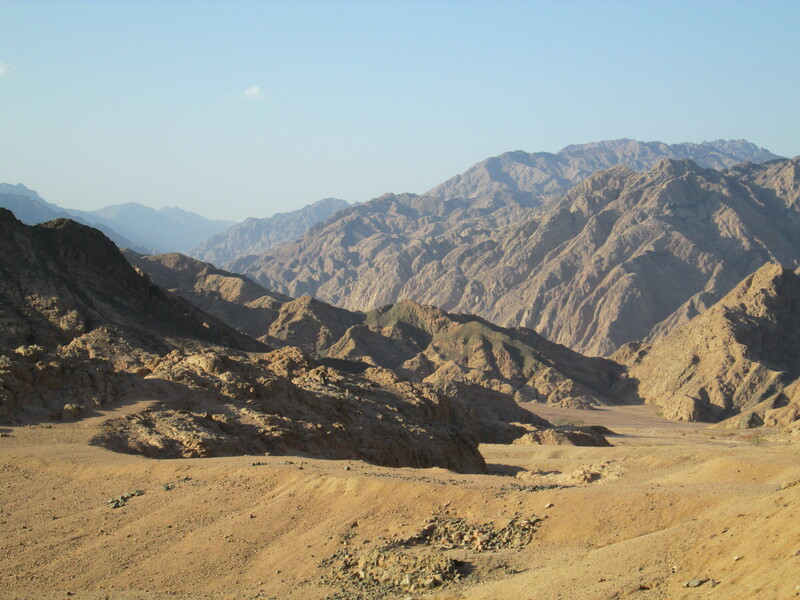 The first thing that struck me was the landscape on the drive up (okay… that was the second thing… the first thing that struck me was the heat… let’s just say it’s a desert for a reason)… the Sinai kind of looked like what I imagine Mars to look like, just slightly less red. Very steep jagged mountains, no plants and an unrelenting sun… even with the a/c blasting I was still schvitizing. The road snaked it’s way along a valley floor between the mountains… we passed a couple of military checkpoints that reminded me that I was definitely not in Spain anymore, and after about an hour we drove into Dahab. Let’s just say Dahab’s first impression is not what I’d call great… I had to remind myself that I’m in a “developing” country… half-built (or half-destroyed) buildings, goat herds wandering around, trash everywhere, either dirt roads or roads with pavement so pot-holed you have to crawl over it, dust hanging in the air everywhere and lots of very beat up cars. I had my driver (I like being able to say that) drop me off in the center of town… which was more of the same as above, just with lots, and I mean lots, of tourist shops. I walked around a bit to get a feel for the main part of town (which I found out was not very big at all). I asked around and found a place to stay, put my bags down and took a nap. I woke up about an hour before sunset (which was at around 6:30 PM… even in September… very strange after coming from Spain where sunset is around 9:30 PM) and took a stroll… and I ended up staying for about 8 days. Sinai desert just outside of Dahab. 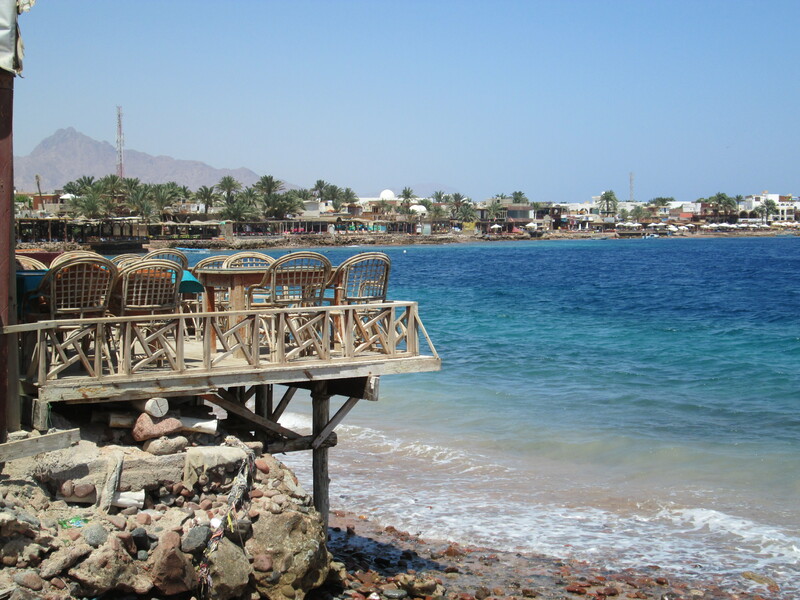 Let’s see… how to describe Dahab… physically, the touristy part of town runs from one end of a small, semi-circular bay to the other. There’s a pedestrian walkway along the water… on the land-side of the walkway there’s dive shops and hotels, and the water-side is lined with cafes built on platforms that extend to, or sometimes over, the water (there’s no real beach to speak of… but each cafe has sun beds on their platforms and usually an entrance into the bay). It takes about 10 minutes to walk from one side to the other. There’s one other street parallel to the pedestrian walkway that has a bunch of tourist shops, some places to eat and more hotels… and that’s really pretty much all there is to Dahab (yes, there’s other stuff off the main roads, but as a tourist there’s nothing really to see). Atmosphere-wise, there’s something about the place that just makes the time drift by… something about the ocean, the heat, the cheap living, or some combination thereof. A common refrain I heard from people was that they came for a week and ended up staying for a couple of years. That same feeling crept over me as well… I came to relax after all, and relax I did. I’d wake up, work out a bit, eat, write, go down to the beach, write, eat, go for a swim, take a nap, eat dinner, have a beer (you could buy alcohol at the majority of places), smoke some shisha and go to bed around midnight. There weren’t very many people there at all (tourism is way down in Egypt right now, plus it was the tail end of their low season), so there’s not much to do in terms nightlife… there’s not even really that much to do during the day actually. 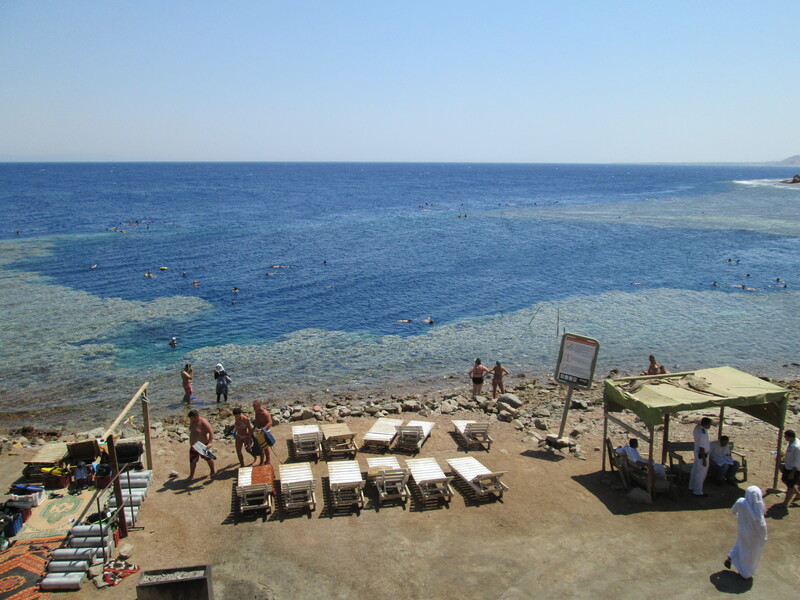 The main attraction in Dahab is the Red Sea, and the main tourist trade here is scuba diving… there’s desert excursions and the like, but most people are there solely to dive. So if you’re not diving (or snorkeling), you’re basically just going to be chillin’ at one of the multiple cafes that line the bay… which is what I was doing. It was perfect for me at the time, but I could see it being very boring for some folks. People-wise, Egypt is the land of the hard sell… I took me a while to get used to having to ignore all the shop/restaurant pimps working the pedestrian walkway (i.e. the guys standing outside trying to bring you into their shop)… but usually a simple la shukran (no thank you) would suffice. As Dahab is a tourist destination, all the workers speak several other languages fluently (generally, English, Russian, Italian and German), so communication was never a problem… it actually makes me feel kind of silly when I can’t speak another language and the 20-year old restaurant pimp that has never been outside of the Sinai speaks four other languages fluently. As a foreigner, I did pick up that there was some tension between the local Bedouin and the Egyptians living their from Cairo (every non-Bedouin I spoke with was from Cairo), even though they both worked side by side… but I never really delved into it with anybody for an explanation. Everybody is hustling, which is nice for tourists such as myself… because if you meet a couple of people you’re friendly with (for example, the hotel guy, the guy at your bar and the guy at the breakfast place), when you need something (i.e. a camel ride, or a snorkeling trip, or you want to shoot a machine gun), you can ask your three guys and they’ll come back with quotes for you to choose from… and I found that the prices they’d come back to you with were always lower than prices I could get by asking around myself (note that all your guys get a cut of the final price, so they have some incentive to find you a good deal because they know you can get whatever they’re offering from somebody else)… it was an interesting switch to make mentally after coming from a standard issue western county. 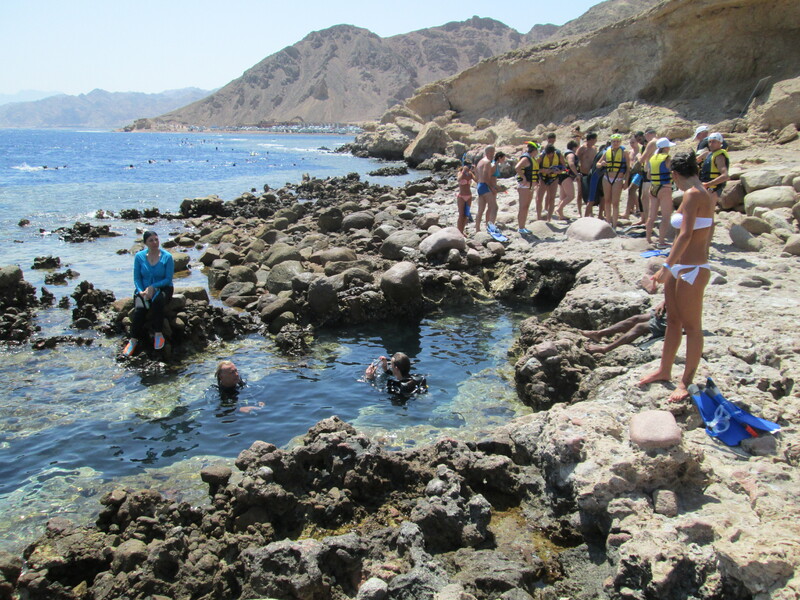 The blue hole… a renowned snorkel/diving site north of Dahab. The crack… an actual crack/break in the reef that allows for easy access to the water around the blue hole. A little fun in the desert with the Bedouin. 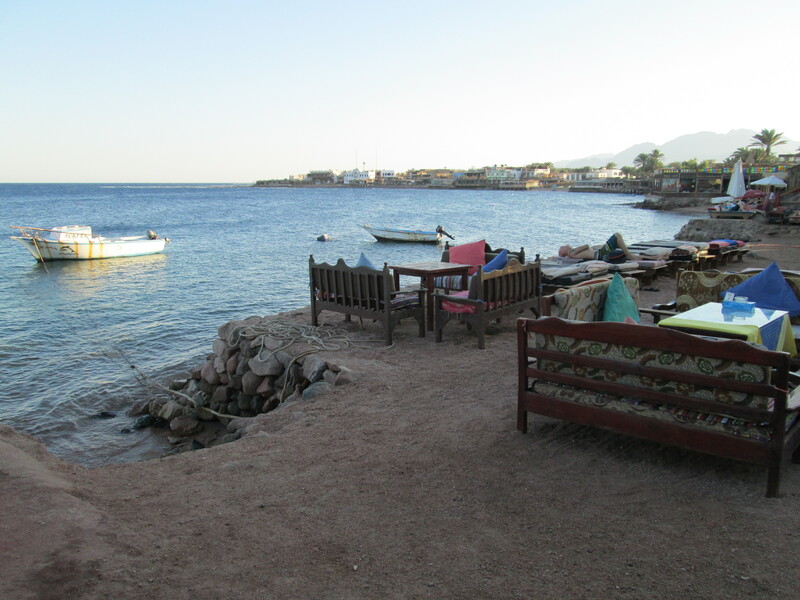 So that’s Dahab in a nutshell… if you want to relax, or learn to scuba, cheaply, then it’s going to be a good place for you (and by cheap I mean private rooms with a/c for $12-$13, good meals for $8 to $10, coffee for $0.80 and beers for $1.50 to $3.00). Other interesting tidbits, you could see Saudi Arabia in the distance across the water, everybody drives trucks because the roads, if they exist at all, are in pretty bad condition, the call to prayer was audible, but not very loud, many locals did wear full white robes with headscarves, and there are cats and dogs everywhere you look (not exactly strays, as people feed them… more like village pets). This entry was posted in Egypt and tagged Egypt by Richard. Bookmark the permalink.